Tuck Pointing / Retail Store Painting LLC. Tuck pointing refers to the process of repairing mortar joints in stone or brick masonry walls by grinding or raking out the old mortar to a certain depth, and then filling in with new mortar. When mortar is in a weakened condition, it causes moisture to break down the stone or brick masonry wall, and possibly cause moisture problems behind it. 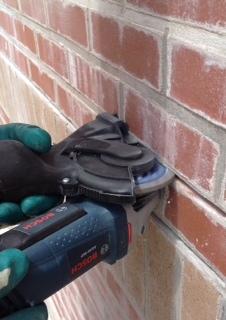 When tuck pointing is done properly, it provides a relatively waterproof mortar joint that extends the life of the wall. Precipitation, even high humidity will cause moisture on, in, and around brick and mortar. During freeze thaw cycles in winter and spring, that water expands and contracts, causing movement and deterioration of the materials. The sun is another culprit to damage to mortar. 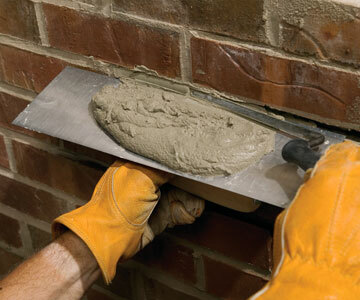 The sun’s UV rays and intense heat combine to slowly deteriorate mortar joints as well. Because darker colored mortar will attract the sun’s energy more, it typically does not last quite as long. Tuck pointing saves a lot of money if you do it before it’s too late. If you don’t tuck point when your stone or brick wall needs it, the masonry wall will deteriorate to the point that the only fix is to tear it down and replace it. A typical new build will require tuck pointing after 30-40+ years. The new tuck pointing, if it’s a job done well, should last 25+ years. Retail Store Painting has the proper tools and knowledge to bring your masonry work back to it’s original condition. Call us today to discuss your project or to for a Free Estimate! !